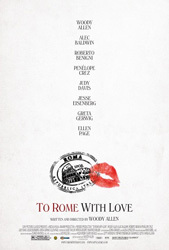 Synopsis: TO ROME WITH LOVE is a kaleidoscopic comedy movie set in one of the world’s most enchanting cities. The film brings us into contact with a well-known American architect reliving his youth; an average middle-class Roman who suddenly finds himself Rome’s biggest celebrity; a young provincial couple drawn into separate romantic encounters; and an American opera director endeavoring to put a singing mortician on stage. Woody Allen has been on a roll of late. Ever since ‘Match Point’, he’s regained the momentum he’d lost right after ‘Mighty Aphrodite’. His last picture, ‘Midnight in Paris’, was apparently his biggest box office success ever, as per some accounts – although it wasn’t his biggest critical success. So he’s doing quite well for himself, some 40+ films into his incredibly long career. I’m a BIG fan, and own or have seen all of his films. But it’s not to say that I enjoy all of his films. In fact, for every movie he makes that I enjoy, he makes one that I find lacking in some respects. Still, given that he is extremely prolific, one out of two is rather good; he releases two terrific films and two average ones at the rate that other directors put out just one picture. Of course, he also tends to tread the same ground from film to film. Anyone who’s familiar with Allen’s work knows that they can all merge into one big blur of romance, infidelity and neuroses. There’s often some form of intellectual or existential exchange and there are often artistic pursuits of some sort by one or many of the characters. He’ll sometimes throw in a little bit of crime or fantasy (or both, as was the case in ‘Scoop’) to spruce things up, but that’s generally the gist of it. ‘To Rome With Love’ is exactly all of the above. It’s pretty much a smorgasbord of Woody Allen conventions taken to a new location, with many new players (although there are a few familiar faces amongst them! ), and tossed together in a way that is specific to Allen. 1. The young american (Jesse Eisenberg) living in Rome with his girlfriend (Greta Gerwig), who must fight his longing for her best friend (Ellen Page), who visiting temporarily between acting gigs and love affairs. 2. The funeral parlor director (Fabio Armiliato) with a gift for opera singing who is pressured by the father (Woody Allen) of his soon-to-be daughter-in-law (Alison Pill) to change careers – even though he only likes to sing in the shower, and despite the protests of his son (Flavio Parenti). 3. The young newlywed (Alessandro Tiberi) whose spouse (Alessandra Mastronardi) disappears and is forced to make use of a call-girl (Penélope Cruz) in her stead for a series of important business meetings with his rich relatives. 4. The italian nobody (Roberto Benigni) who suddenly, inexplicably, becomes a media sensation overnight and has to deal with the trappings of fame and its impact on his relationships. There is also the story of an architect (played by a chunky, worn Alec Baldwin) revisiting a neighbourhood he once lived in many years prior, but this is actually just a device for enabling some comedy into the first story, which would otherwise primarily be a drama. Here, the lines between reality and fiction are blurred as the architect shows up time again, unannounced, and forces the characters’ inner dialogues to be exchanged openly. This is a trick that Allen has used before in ‘Play it Again, Sam’ and ‘Mighty Aphrodite’, but it works in this context too – Baldwin observes Jack’s (Eisenberg) behaviour and comments on the ridiculousness of it all. At first, it’s unclear exactly what is being said openly between the characters and what is strictly a manifestation of their subconscious, but it’s not too complicated figuring it out after a few minutes. Similarly, the architect’s role is inexplicable in the beginning, and one is left wondering how he happens to be involved in the group dynamic. But that also becomes clear soon enough. The tale of the funeral director is straight enough and is mostly played for laughs. Watching him sing in the shower is quite an amusing sight and the insistence of Allen’s character can be quite funny – the results of which are even more enjoyable. Allen’s own thoughts about mortality come through in these sequences through Judy Davis, who plays his psychiatrist spouse. As he inches his way through his seventies, Allen obviously has a few thoughts about what lies in wait. The story of the young couple that gets split up is also meant to be humourous, but I found it not only clichéd but extremely contrived. Not only did it not make sense that they would be split up the way that they were (ex: she could easily have called him at the hotel from a local phone ), the way the Cruz character was forcibly wedged into the mix was stupid; he could easily have avoided the whole situation. Still, it had moments, and Mastronardi was adorable. My favourite bit was the Benigni segment, even though it reminded me of ‘Louis 19, le roi des ondes’ (and, ‘Ed TV’, it’s American remake). It has been done before, but I like Allen’s take on it, especially since he himself doesn’t fall prey to the media attention so much – he even avoids going to the Oscars or buying into all that publicity. So his commentary on celebrity in ‘To Rome With Love’ doesn’t appear ironic or hypocritical at all. What’s best is that he knew how to make the most of the material without building a whole film out of it – which would have been overkill. The movie looked good and the acting was perfectly suitable for the material, even if some of the actors were less convincing than others (Ellen Page as a seductress? Really? I didn’t feel any of her so-called magnetism ). My only real beef was that the vignettes are interspersed in a random fashion, not following a proper timeline. That threw me off at first, because some bits take place in one single day, and others over many days – so I wondered was going on when we had gone through a whole night in one sequence, but were still on the same day in another. But one gets used to it and it’s relatively easy to accept. Actually, for reasons such as this, I’d say that “To Rome With Love’ is a grower – not just during the course of one viewing but over many viewings. It has many, many flaws, including some stilted dialogue, but it’s such a fun mishmash of characters, stories and locations that it’s almost impossible to not be pulled into its magic. It’ll never be considered one of Woody Allen’s masterpieces, that’s for sure, but it’s certainly one of the good ones – it’s entertaining and it has plenty of replay value. It may not be a love letter to Roma, per se, but Allen lovingly lends it his quirks for a little over 90 mins. Fans of Woody Allen will most certainly be pleased.